I hate social media sometimes. The thing that makes it so terrible is the mass amounts of articles I can’t stop clicking on — Buzzfeed being one of the most well-known producers of these types of articles. Buzzfeed, along with its competitors, have many annoying advertisements and interruptions within the individual pages to make navigating these pages a complete hellscape. The webpages turn into a cluster of useless junk that does not relate to the articles at all. One beautiful, beautiful app has made my article browsing so much easier. 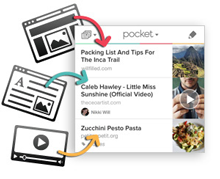 Pocket allows you to save articles you want to read, whether now or later, and presents them to you in a cleaned-up fashion. By this I mean it eliminates the junk on each page and gives you a simple viewing of exactly what you are looking for. At first, I was skeptical that the app would make much of an impact on my article viewing ways, but I was sorely mistaken. Apparently Twitter’s mobile app allows you to connect to what is referred to as a “Read Later” service, which is what Pocket is. When you log in to Pocket within Twitter, you are allowing Pocket to become available as a saving option for articles. Once you are connected with Pocket, find an article you want to save and hold the link. The option to “Send to Pocket” arrives. These are the magic words. You can save as many articles as you please on your Pocket list. So if you are simply browsing Twitter or Google on your phone, and want to save articles for your reading pleasure before bed, it is now a simple click away. This way you won’t have to worry about refreshing apps which will lose your place after you click on a link. Unfortunately, I don’t think Facebook supports “read later” apps, so Pocket does not work there. Until then, it works perfectly fine on Twitter and countless other social media apps.